Dominating the Easter dinner...golden brown, tender and juicy! Proud of her noble lineage, this appetizing Birds Eye Roasting Chicken is the meatiest bird that ever strutted its superb chicken flavor smack into your oven! No farmyard gadabout, she! Her entire life has been devoted to tenderness -- to enforced ease. Fattened up on buttermilk and cereals -- this U.S. Government-inspected, Grade A chicken, boasts 10% more white meat than busy show-off scratchers! I was perusing the archives in order to write an Easter-themed guest post for a friend's blog. My friend Stephen -- "The Lazy Scholar" -- blogs about the digital resources he comes across in his work (or in procrastinating from same). 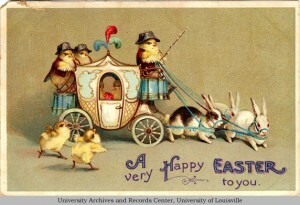 He pointed me toward a few fascinating sources for my post about the secular side of Easter, like the University of Louisville's Newton Owen Postcard Collection, where I found this early-twentieth-century gem: What better way to wish you a happy third Sunday of Easter?